The anticipation for Ridley Scott’s Prometheus is reaching Phantom Menace levels of hysteria. Usually, the marketing campaigns for summer blockbusters are exercises in overkill. They leave the viewer feeling browbeaten and overwhelmed before they even set foot in the theater. Thus far, the Campaign for Prometheus has had the opposite effect. The more people see, the more they want to know. If it’s truly more the public wants, than 20th Century Fox has obliged them in more than one sense of the word. Yesterday evening, Ridley Scott participated in a Q&A with audience members at the Wondercon in Anaheim. This was immediately followed by the world premiere of the full length trailer. The trailer, like the Q&A, answered a few questions while raising many others. What’s known of the story goes something like this: Sometime in the late 21st century, archeologists and scientists discover pictographs which suggest that all life in the known universe shares a common origin. This discovery comes along with an invite. A higher extraterrestrial intelligence bids humankind to seek them out. We do so in a spacecraft called the Prometheus. Upon landing on a mysterious planet, the crew of the Prometheus indeed discovers signs of intelligent life. Unfortunately, what they find is hardly inviting or benevolent. Ridley Scott has confirmed that Prometheus is, in fact, a prequel to Alien. However, he’s being rather vague about how much of a prequel it actually is. During the Q&A, he made it clear that it isn’t merely another entry in the Alien franchise, but a self-contained sci-fi epic in its own right. Judging by the trailer, Prometheus indeed has the DNA of Alien flowing through its bloodstream, though it is very clearly its own unique beast. The trailer very slyly toys with iconic imagery from Alien. The derelict spacecraft that the crew of the Nostromo encountered on LV-426 is shown. Ridley Scott once said he always pictured the derelict craft as a weapons transport and the eggs as ordinance. According to the info provided in the trailer, the crew of the Prometheus set a series of events into motion by accepting the Alien “invite.” The accompanying dialogue seems that the derelict craft from Alien was initially being sent on a mission to earth. The infamous “Space Jockey” is also shown. Something seems to be morphing or materializing around it. The shot is so quick that it’s hard to tell what exactly is happening. There’s also an impression or sculpture of the xenomorph on the walls of the egg chamber. These images are flashed briefly, so as not to allow them time to fully register. Bear in mind that actual xenomorphs, facehuggers, and eggs are never shown. This is likely to keep the surprises in the film hidden, as well as to allow Prometheus to have its own identity in the marketplace. 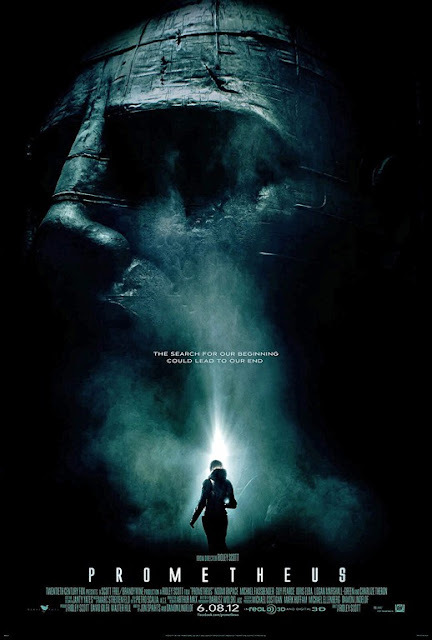 Prometheus is shaping up to be the most intriguing summer blockbuster since Inception. It’s a giant puzzle begging to be solved. This may just be the first prequel ever that answers a burning question at the heart of a franchise, while allowing the shroud of mystery surrounding said franchise to remain intact. This trailer tempts viewers to step into the mist and see what all the fuss is about, which is exactly how a trailer is supposed to function.